Art Deco architecture is a very characteristic form of early 20th-century architecture that shaped the skylines of many cities around the world. Some of the most famous skyscrapers still standing and in daily use today, as well as many smaller buildings and structures, are in Art Deco style. Art Deco is short for Arts Décoratifs—French for "Decorative Arts"—and originally referred to an exposition that took place in Paris in 1925. However, the movement encompassed much more than what people think of today as decorative art objects. Instead, Art Deco sought to combine functionality with a celebration of the technology of the Machine Age on the one hand and the beauty of decoration, including updated references to traditional and ancient motifs, on the other. Some of these motifs are geometric, while others involve depictions of foliage, animals, people or gods, or even hood ornaments from cars, as is the case on the Chrysler Building in New York City, which has such ornaments in place of gargoyles, high up on the sides of the building's exterior. There was also a subset of Art Deco architecture that was specifically inspired by Mayan art. 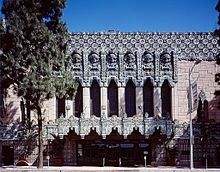 One example of this style is the Mayan Theater, now Club Mayan in Downtown Los Angeles. However, various ancient civilizations influenced the Art Deco style, including Mesopotamia, Egypt, Greece and Rome. In addition, the Cubist style in painting and sculpture also had an influence on Art Deco architecture, particularly some of the forms in Art Deco reliefs, and also inasmuch as Art Deco employed various shapes similar to some of those used in Cubist geometrical simplifications of natural forms. Curved lines Much Art Deco work has streamlined curves in it. Doors Art Deco buildings often have characteristically decorated doors. Lamps Interiors often have lamps with pleasant geometric designs. Reliefs Reliefs on classical, neo-ancient or modernist subjects are an optional but relatively common feature of Art Deco façades. Zig-zag lines Many Art Deco buildings, including loads of movie palaces throughout the world and the Empire State Building in New York City, have symmetrical zig-zag patterns (often a combination of horizontal and vertical lines, rather than diagonals), whether in their marquees or in the overall structure of the building. As Shanghai was a rollicking and largely European-dominated city in the 20s and 30s before World War II, it has notable Art Deco buildings, and although their size is dwarfed by the skyscrapers built since the 1990s, they still have prominence in parts of the city, particularly the Bund and former French Concession. There are also a few Art Deco buildings that were constructed in Changchun when the city was the capital of the Japanese puppet state of Manchukuo between 1932 and 1945. Bandung has a large number of Art Deco buildings built by the Dutch when they still ruled the lands then known as the Dutch East Indies, and many of them are quite distinctive and beautiful. There are various Art Deco buildings in other places, too, including the Railway Station in Yogyakarta. In addition to beautiful colonial architecture, the Portuguese rule left behind many Art Deco buildings in the country, many of which fortunately survived the long civil war that took place after Angola won its independence. They can be seen mainly in Luanda, the national capital. You might not expect to see Art Deco buildings in Eritrea, but if you go to Asmara, you can. Eritrea was under Italian occupation from 1890 until Mussolini's troops were defeated by Britain in the Battle of Keren in 1941, and the Italians were certainly influenced by Art Deco. Have a look at the Cinema Impero and Fiat Tagliero buildings if you are in Asmara. The Italians brought their love of Art Deco to the Dodecanese during their rule of the archipelago roughly between the World Wars, building the planned town of Lakki (Italian: Portolago) on the island of Leros, which they envisioned as a great naval base in the Eastern Mediterranean and where a mansion built for the fascist dictator Mussolini still stands. Among others, the church of Agios Nikolaos, probably the only Art Deco Greek Orthodox house of worship in the world, is especially notable. The principal town of the nearby island of Kos, levelled during a 1933 earthquake, was also re-built by the Italians on a new plan, filled with buildings that have varying degrees of Art Deco influence. France was the birthplace of Art Deco, and while there are not too many examples in Paris, there are numerous Art Deco buildings scattered throughout the country. One notable example is the magnificent Palais de la Méditerranée in Nice, which now houses the local Hyatt Regency hotel. In the 1930s, a period of quick modernization during the early decades of the republic, Turkey saw a great upswing in railtrack constructions, and the accompanying train stations were built in the most fashionable style of the era. As such, the sides of the railways all over the country, but especially in the east where the coming of the age of steam and trains coincided with that of Art Deco, are littered with Art Deco station buildings big and small, one impressive example being the central station of the capital, Ankara, while the relatively smaller sized station of the major railway junction of Afyon in the west of the country is also worth a look if you happen to be nearby. Art Deco was a popular style in the United Kingdom, although sadly many buildings have not survived. Many cinemas, department stores and seaside hotels and attractions, as well as housing including blocks of flats (apartments) were built in the style. In London several Underground stations in outer boroughs are in an Art Deco style. Buildings of note in London include Battersea Power Station, Victoria Coach Station, BBC Broadcasting House and The Dorchester Hotel. There are many, many Art Deco buildings throughout North America. Canada has a large number of Art Deco buildings, including the Édifice Aldred, around the corner from the Basilique Notre-Dame in Old Montreal. That skyscraper has a classic zigzag pattern, starting from a broader base and tapering higher up, and beautiful decorative details closer to the ground. Mexico City has some important Art Deco buildings, including the magnificent and fanciful Palacio de Bellas Artes. Of particular note in the United States is the landmarked Art Deco District in Miami Beach. In New York City, notable Art Deco buildings include not only the Chrysler Building but also the Empire State Building and the entire Rockefeller Center complex—all in Midtown Manhattan—and the Central Library of the Brooklyn Public Library at Grand Army Plaza. Another notable and impressive Art Deco building (still as of 2016 the tallest building in Baton Rouge and the 7th-tallest in Louisiana, at 34 stories) is the Louisiana State Capitol in Baton Rouge, built in 1932. A brief period of Pueblo Deco architecture was popular in Arizona and New Mexico, combining indigenous cultural styles with Deco. Napier, New Zealand, having been destroyed by an earthquake in 1931, is chock-full of Art Deco buildings constructed when the city was rebuilt. Anyone who is a big fan of Art Deco and wants to see it in quantity should consider a trip to Napier. Nearby Hastings also has buildings from the same period, and there are several Art Deco buildings in Wellington, the capital of New Zealand. There are many Art Deco buildings in Argentina, especially in Buenos Aires. Included among them is the striking Edificio Kavanagh, a skyscraper, which is depicted in this article. Across Rio de la Plata from Buenos Aires, the Uruguayan capital, Montevideo, also has some fine Art Deco buildings, most notably the Palacio Salvo, which towers over the city from its location in the heart of downtown. Many Art Deco buildings were built as theaters, concert halls, cinemas or libraries, and quite a few still function as such. Some of them have been converted into nightclubs, restaurants or shops. Quite a few Art Deco buildings are hotels. In Shanghai alone, these include the Hotel Metropole, Peace Hotel, Park Hotel, and the original Jinjiang Hotel on Maoming Road. Miami Beach has many original Art Deco hotels near the beach. This travel topic about Art Deco architecture is an outline and needs more content. It has a template, but there is not enough information present. Please plunge forward and help it grow!